Going on 25 years, we still don’t have all the answers. What gets us excited about the next 25? Working with you to ask the right questions. BuildingGreen believes in having fun while saving the world. Enough with all the eco-babble! Just give us the answers! 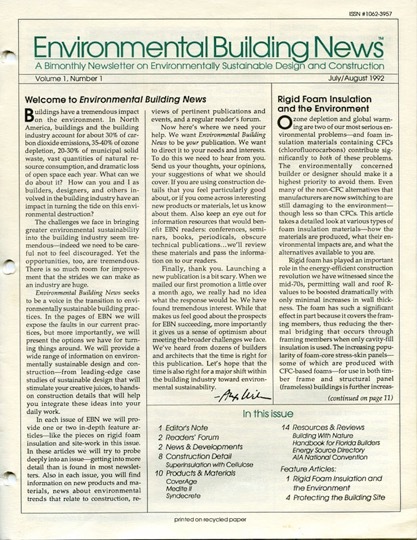 Those words were the most memorable of the extensive and varied feedback we received from readers after introducing Environmental Building News in 1992. The comment arrived on a paper reader-response card we’d inserted into the printed issue on its way to the post office. As we now begin our 25th year of publishing, we still like to give our readers plenty of context so that you can understand our recommendations and make your own decisions. And, with your help, we’d like to think we’re asking the right questions. Sometimes that’s more important than having all the answers. In 1992, the world was different. Environmental Building News—now embedded in BuildingGreen.com—was the first North American publication devoted to the nascent field of green building, and the Internet was mostly for scientists. In 1992, the U.S. Green Building Council didn’t exist. LEED, the program that eventually came to define green building in the U.S., wouldn’t emerge for another eight years. The only national organization in this space was the American Institute of Architects’ (AIA) Committee on the Environment. Before we launched EBN, BuildingGreen (founded in 1985) was a technical writing company that split its time between freelance writing for various magazines and contracted projects for such entities as utility companies and state energy offices. The contract work kept food on the table, but the freelance writing was more satisfying—especially when we got to write about the issues that most excited us. We launched EBN to help transform the building industry—which has one of the biggest environmental footprints of any industry. We didn’t know much about publishing when we started out, but the desktop publishing revolution and new-fangled laser printers made it a lot easier to break into the business without much capital. And if we were publishing our own newsletter, we reasoned, we could write about whatever we and our readers were excited about—rather than having to please editors in New York City offices, or kowtow to the advertisers that are the true customers of most magazines (and now, most websites). 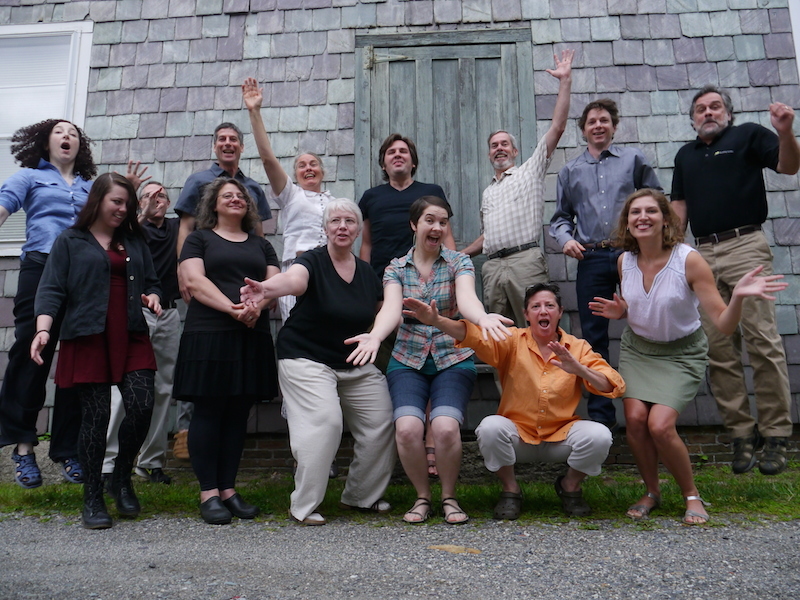 Environmental Building News seeks to be a voice in the transition to environmentally sustainable building practices. In the pages of EBN, we will expose the faults in our current practices, but more importantly, we will present the options we have for turning things around. We’ve had that promise in mind ever since, and it’s led us to sacrifice some sacred cows in the pursuit of the truth. Our 1997 feature article on disposal of preservative-treated wood called for a phase-out of chromated copper arsenate (CCA); that came about in 2002. A widely referenced 1999 piece, “Small Is Beautiful,” noted the significance of house size on environmental performance. Our 2004 article on brominated flame retardants in building materials first brought this concern to the attention of building professionals. In 2007, “Driving to Green Buildings: The Transportation Energy Intensity of Buildings” pointed out that more energy is often used getting to and from a building than in the building itself. Our view of a topic typically evolves as we conduct research, but rarely as dramatically as in 2009 when we were excited about the growing practice of putting wind turbines on buildings. The headline of that piece, “The Folly of Building-Integrated Wind,” shows you where we landed after we followed the data. We were as shocked as many others about the negative impact of common foam insulation on global warming when we researched and covered this topic in 2010. There has never been a shortage of topics for us to explore and demystify for our readers. If any of our articles have affected your practice over the years, please share those stories on the attached reader-response card…oh, sorry…in the comments! We see the next 25 years as even more pivotal and disruptive than the last. The first edition of EBN did not yellow with age. It’s just that In 1992, recycled paper wasn’t white. The same dynamic applies to other ecological challenges: loss of habitat and biodiversity, access to clean water, and toxic releases affecting both our built and natural environments. Eventually, there will be a response to these problems on the scale of the Manhattan project, the Marshall Plan, or the New Deal. When that happens, those organizations that have been proactive in developing and implementing climate-friendly, ecosystem-safe, low-toxicity solutions will be positioned to capitalize on their foresight. That’s what we mean when we talk about “market transformation” in the context of green building. And you’re a big part of that change. Like many of you, we are committed to helping companies and institutions do the right thing—taking steps that make economic sense even in current conditions but are essential to be prepared for the future. We are doing that on the pages of BuildingGreen.com, in our curated lists of BuildingGreen Approved products, and through online help tools like LEEDuser. We are also doing more and more of this work—informing, advising, teaching, training, and facilitating—on a custom basis to help you make an impact. Whether it’s researching and writing an authoritative report for a professional association, helping a real estate owner implement a smart list of preferred products, or reviewing construction details in plans and specs, we’ve always leveraged the reach of our publications and websites to solve our clients’ specific problems. Consulting and other custom services were the foundation of our business before we created EBN, and they have been a core part of our offerings ever since. To bring about a healthier relationship between human society and the natural world by helping building professionals create and nurture high-performance, resilient, and inspiring buildings and communities. We can only achieve that mission by leveraging both our publications and our direct services to help realize great buildings and communities. We can’t afford to wait another 25 years before seeing meaningful results. Congratulations to the whole BuildingGreen team! Since the first EBN, you have published the most informative, clearly written, unbiased work in our field. I still have my issues from the first and subsequent years and refer to them (and yes, I miss the paper versions). Thanks for all you have done and continue to do. I would add to that list Alex's groundbreaking editorial in December of 2015, titled "Passive Survivability," written in the wake of Hurricane Katrina; that piece launched the resilient design movement and has become a critical sustainability metric as our industry deals with the increasingly common and severe weather events due to climate change. Environmental Building News has been and continues to be the only consistently BS-free source of information within the green building space. Your long-ago decision to avoid advertising was highly prescient. Green building has been, among other things, the greatest marketing opportunity in what was a low-innovation industry and it has become increasingly hard to separate the flim-flam from the real thing. It's hard enough to figure out the right answer to these complex questions, and it is very reassuring know that your analysis reflects your honest best knowledge of the facts and circumstances within the industry. My "go to" site for accurate and well-research green building information since day one! Keep it up!